"By any measure, Zeitlin's output over the past 50 years places him at jazz's creative zenith." Click HERE for Streaming: All the performances will stream live. Watch for free from anywhere in the world & leave messages in real time. "...he is an improvisational artist whose skills are so expansive that he can integrate everything he hears into the fabric of his soloing. In the best sense, in the manner that has always been true of jazz's finest improvisers, Zeitlin constantly stretches the creative envelope, measuring himself only against the infinite demands of his music." "...Zeitlin delivered a riveting solo performance." "In supreme command of the keyboard...he employs striking dissonances, he constructs extraordinary edifices of harmonics, he can be marvelously pianistic, with a velvet subtlety of touch. 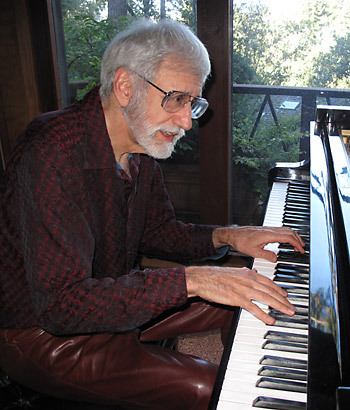 He is an original...Denny Zeitlin stretches jazz piano beyond any hitherto defined limits." "...He didn't show his brilliance through his technique (which he has), but through subtle improvisation, advanced and finely-tuned harmonic development, and a stupendous internal sense of meter...Denny Zeitlin's solo piano was the unpretentious highpoint of the festival." Denny Zeitlin is not simply a very good pianist. He is a great one...one of the most highly accomplished musicians writing for and performing on the instrument today...throughout this magnificent record (superbly engineered at Dizzy's Club Coca Cola, at Jazz At Lincoln Center) one is continuously impressed at how Mr. Zeitlin is alive to the complex pleasure of contemporary music...and how blessed he is to have two of the most magical players on their instruments..."
"...Williams creates giant ripples, Wilson is like unto a force of nature, and Zeitlin storms and swirls without leaving the listener behind, maintaining a (restless) lyricism throughout...Zeitlin is up there in the pantheon with Corea, Tyner, and Herbie Hancock." "...Wishing On The Moon represents the Denny Zeitlin Trio at the peak of its powers, on one of those nights when all the gears meshed, and all the stars aligned around that shining moon." "...this newly released album features Denny at his explorative best, taking standards apart and reassembling them with curiosity and daring..."